In the above picture you can see in the back corner, just to the left of the classroom door, is my “teacher desk”. On it sits the desktop computer that is hooked up to my projector. But the projector points at a screen that is behind where I’m standing in this photo; across the room from the computer. This means that when I’m teaching, if I need to type, switch tabs, manipulate anything on screen I have to go to the other side of the room from where my students are looking. So I wind up talking to the backs of their heads while they look at the screen. Now, I don’t spend a ton of time teaching from the “front” of the room. We do a lot of group work. But it’s still inconvenient. I had partly solved the problem for powerpoints by purchasing a clicker that allows me to move the slides ahead from across the room. This was most useful for my teaching at uOttawa this past semester. But the other day in my high school classroom, I was leading the students through a linear regression problem on the graphing calculator. I had the graphing calculator software on the screen but had to be behind where my students were looking in order to manipulate it. So I had an idea to purchase a wireless keyboard & mouse set. But when I got it all set up on a rolling cart (needed a surface for the mouse to be on), it wouldn’t work all the way across my classroom despite claiming a range of 30 feet. I tried halfway across the room and it would only work sometimes, losing contact w/ the computer every minute or so. Well, that’s no good! This one has been awesome! A bit more expensive, although as of this morning it’s on sale until Thursday. The mouse is integrated into the keyboard which means I don’t need to set it on a surface for it to work. The keyboard is light so I can easily move around the room with it in my hands. And this one works in every corner of my classroom! 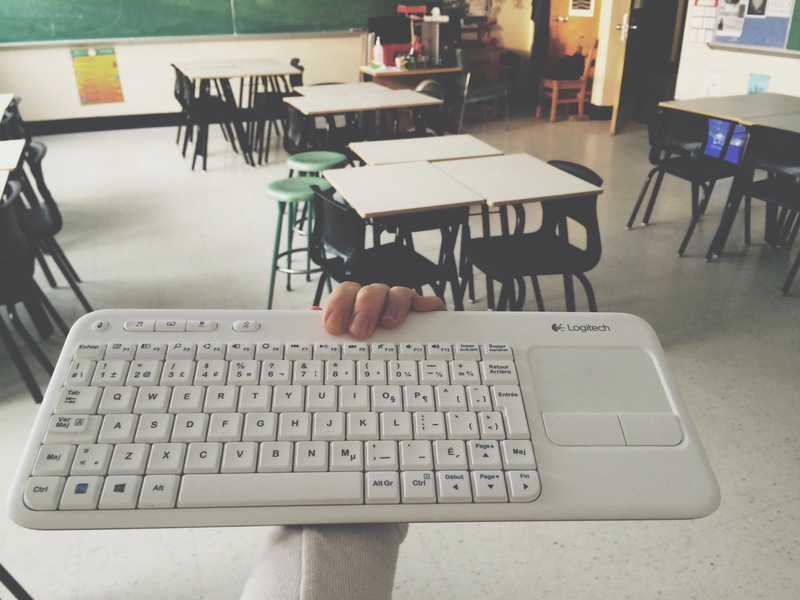 I can walk around the desks, stand near the front, even hand the keyboard to a student to have them work on the board with it. If I had my way, I’d set up every classroom with one of these babies! Need to count out sheets of paper easier & faster? All you need is a pen or pencil and an elastic band!